I´m new to EAStudio, demo account only at this point, but hope to make the purchase very soon. I have generated a couple portfolios and am currently running them on a demo account. All going well, except I have come across a small issue. Each day, my broker - Pepperstone - closes for 2 minutes at 5pm EST (which is when their Daily charts roll over). The reason it closes, as stated on their website, is because Pepperstone and banks reset their servers and liquidity is low. Because of this closure, trades are not being executed at the start of that candle, either closing an open trade, or opening a new trade. I´m sure there´s a simple solution to this problem. Any ideas? Would increasing the "trade count retries" in the code help? 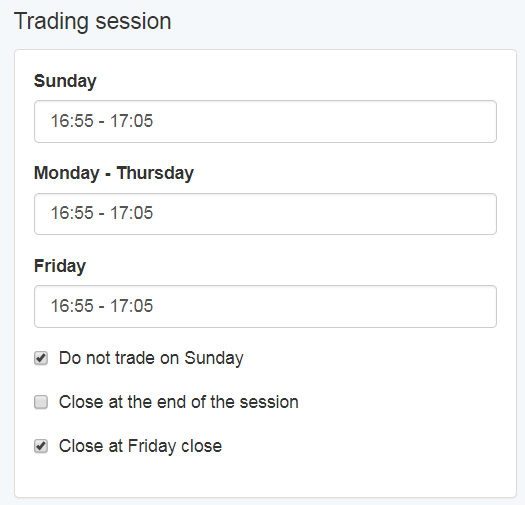 Did you have you tried change the Trading Session in Settings? Thanks for the suggestion ViniQ. I´ll give that a try. Looks like that should do the trick. Vini, this is not exactly what Beauh needs. The Trading Session works best if your broker provides data feeds for the whole day, but trade from 09:00 to 16:30 for example. In that way we can set EA Studio to create strategies that trade for this period. The shown problem has no a trivial solution in EA Studio. On the other hand, FSB Pro can use Entry-Time and Exit-Time indicators in the Generator for preventing the trades in that period. Thanks Popov. Would increasing the "trade retry count" or "trade retry wait" help with the problem? It may help, however it may a negative effect on the strategy logic because it will delay the entry with 2 minutes. This is technical problem of the broker that it looks like they cannot solve himself, although they have full access to the market data feed, the trading terminal and the account data. is there a broker which has no problems with delaying into the order execution? For example for me the backtesting is not the same like live trading. I really don't know if this is a Expert Advisor Studio or Broker problem. Sometime the Expert Advisor in live trading is missing the execution of trades which appears in backtesting. The experts created with EA Studio and FSB Pro comply with the MQL requirements and best practices. Even more, the EA Studio experts use only MT standard indicators. If you notice a compilation or execution error please report and we will fix it immediately if it is in the code. Please note that if an expert advisor compiles with 0 errors and 0 warning and works without crashes, it must trade as expected. If one order corresponds to the backtest but another not, it is sign that there is execution issue either on the terminal or in the server platform. Is it possible to use a "retry order execution" into Expert Advisor Studio? This feature is implemented in the expert. It repeats an order 3 times if the execution fails on broker's side. You can modify the repeat counter or the repeat interval as you wish in order to make the expert trading better in your broker. It is also possible to make modification that ignores or postpones the signal for the "dead period". is the feature somewhere in menu? or do I have to go into the code?